Bring your Laptops this will be a hands on workshop. This is an overview presentation that will demonstrate how the features of the Agent Marketing System will give you the Unfair Advantage in the Real Estate Industry. We will show you how top producers in the Industry use systems in their business allowing them to focus on the money making activities . 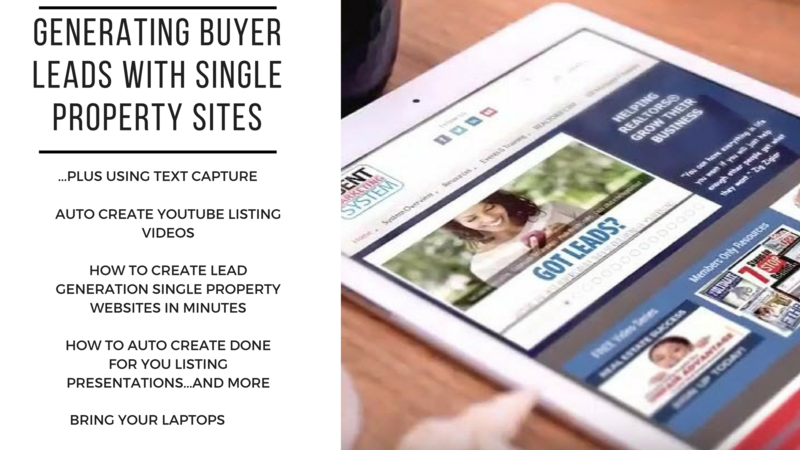 -HOW TO CREATE LEAD GENERATION SINGLE PROPERTY WEBSITES IN MINUTES. DON'T MISS THIS INCREDIBLE INFORMATION SESSION! Lunch Provided. All participants will be given 30 days full system access plus a special gift for attending.